Rep. Sean Scanlon explains ride-share legislation to news media. 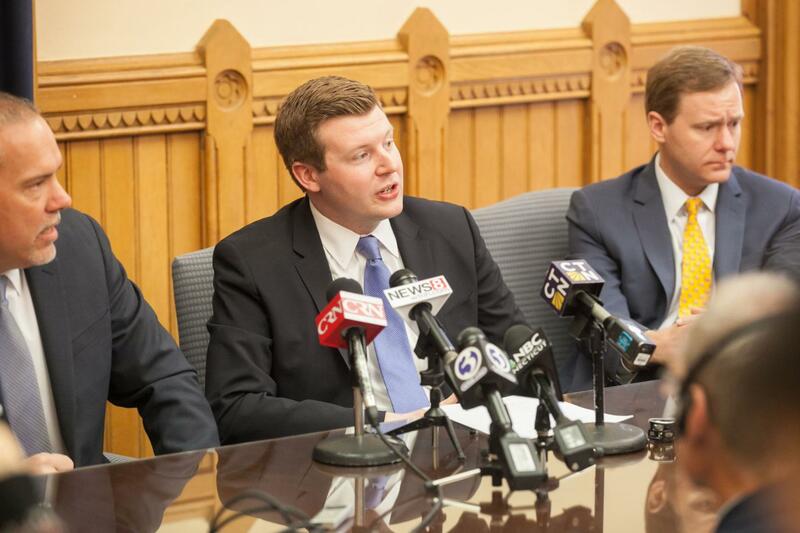 Representative Sean Scanlon, co-chairman of the Insurance and Real Estate Committee, led the House Thursday in passing legislation that would for the first time regulate ride-share companies in Connecticut and protect consumer interests and safety. Currently, there are two ride-share companies in Connecticut: Uber and Lyft. If enacted, House Bill 7126 would among other things require transportation network companies like Uber and Lyft to carry insurance for their customers, perform background checks on drivers and have their cars pass a 19-point safety check. Uber has been operating in Connecticut for about three years and the legislation is a step in the right direction for consumer safety and protection, Scanlon said. “These companies are incredibly popular and we don’t want to stifle their growth, but we also want to protect consumers,” he said. In addition to insurance and checks on drivers and their cars, the legislation has a requirement to make sure no one is discriminated. The bill also addresses the issue of dynamic pricing so that people can’t be charged unreasonable fares in bad weather or declarations of emergencies.